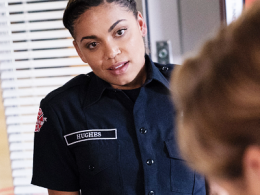 Station 19 ended its fall finale on a literal cliffhanger. 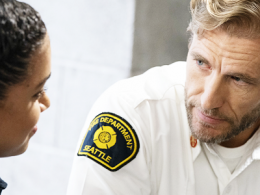 On Thursday’s episode, titled “Weather the Storm,” the Station 19 firefighters face a dangerous Seattle windstorm that takes them away from their Thanksgiving festivities — and by the end of the hour, two of the main heroes, Andy Herrera (Jaina Lee Ortiz) and Captain Robert Sullivan (Boris Kodjoe), are in jeopardy. After losing contact with dispatch due to the violent windstorm, Andy takes matters into her own hands, attempting to drive the ambulance she and Sullivan are in, with their patient in tow, to Grey Sloan Memorial Hospital. But they don’t make it. As it’s revealed in the closing seconds of the fall finale, the ambulance is seen on its side and over a tall cliff. Did Andy and Sullivan make it out before the crash? Following the fall finale, McKee breaks down the biggest moments from the first half of the season, including Andy and Captain Sullivan’s fates, Ripley (Brett Tucker) and Hughes’ (Barrett Doss) steamy secret romance, Ryan’s (Alberto Frezza) dilemma with his troublesome father (Dermot Mulroney) and much more. Ripley and Hughes’ secret romance is really heating up. If and when their relationship does come out, what sort of fireworks should we expect? They will definitely be facing obstacles, both on a big departmental scale and on a small scale. We’ve also seen, even within the station, when there is a secret romance that no one knows about, they feel betrayed. There will definitely be fallout along the way and the danger of that fallout too. They started interacting in season one and from the beginning, even if they were adversarial, they had this intense sparkle between the two of them — like two magnets who can’t quite resist finding their way toward one another. I’ve been interested in capitalizing on that chemistry and looking at these two as the unexpected romance. Yes, they’re hot and steamy but if that starts to deepen and continue and move forward, it gets even more complicated when feelings are suddenly involved too. There’s nothing more fun than a secret romance. Was Ripley and Hughes’ pairing something that you saw coming? I have known since last season and was excited to start planting the seeds as much as I could, so that it would hit viewers as a surprise and so that it could feel built. Are they going to be keeping this secret for a significant period of time? I’m always an advocate for whatever gets us the best story. I really like to enjoy it for a minute. I don’t always want to put two people together and immediately throw a bunch of obstacles before we had a chance to enjoy the fun of it too. I’m a fan first. I think we have a minute before we have to mess it up. Looking ahead, what can you preview in terms of where the action picks back up again? We have a number of things thematically that we’re looking at for the second half of the season. At the end of the day, at its core, we always try and showcase these complicated, interesting characters being heroes, especially right now with all of the [California] fires. It’s important for us to honor and showcase these characters in that way, that no matter what messy stuff is happening in their personal lives, when they show up for work, they show up fully and they do incredible work and really heroically. That’s a focus for us, but especially now, we want to highlight and honor firefighters and first-responders. And in their personal lives, they’re going to be really, really juicy. 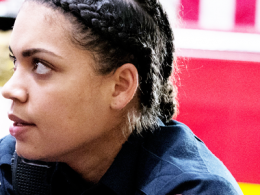 Station 19 returns for the second half of the season in 2019 on ABC.